Where do I use my Chitter Chatter voucher code? Chitter Chatter provide a huge range of pay monthly contract, pay as you go and sim free mobile phones including iPhone’s 7,8, 7 plus and 8 plus as well as Samsung Galaxy models, Sony Xperia and Huawei phones. You can also discover pre-owned phones, upcoming phones, phones available with T-Mobile and Orange upgrades and phones with Plusnet deals. Shop for your phone by manufacturer whether it be Apple, Sony, LG, Samsung, Nokia or Motorola and find the perfect model at an affordable price. You can also discover mobile wifi, tablets and data SIMS. If you’re looking to upgrade you can use the EE Upgrade Checker to find EE, T-Mobile and Orange upgrades, or if it’s a SIM only plan you’re looking for you can discover 30 day flex plans, 12 and 18 month SIM plans, 30 day plans, mobile broadband SIMs and Plusnet SIM plans. As well as all this Chitter Chatter also provide broadband options including Sky TV and broadband packages and mobile broadband packages. As well as a great array of mobile services Chitter Chatter also provide additional services including Sky TV and Broadband deals, a coverage checker, an upgrade checker, handy features and articles and phone and tablet repairs. If you’re looking for Apple or Samsung accessories for your phone you can find exactly what you’re looking for in the Chitter Chatter accessories section. In the huge selection of accessories you can find cases and covers, screen protectors, power banks, essential packs, Bluetooth headsets, microSD cards, chargers and wireless headsets from brands like Universal, BlueNext, Samsung, Integral, Jabra, Just Must, Olixar, OtterBox, Switcheasy and UAG. If you want the latest in entertainment, cinema and sports as well as the best deals on Sky TV, Sky Broadband and Superfast Sky Fibre, you can find it all at Chitter Chatter. Browse online and discover affordable Sky TV packages, Sky broadband and fibre packages and individual Sky Broadband packages that include broadband shields, Sky hubs, Sky talk and a service tech team, all for an affordable price. Gain access to over 400 Box Sets with Sky TV including Game of Thrones, Dexter, Scandal and Tin Star as well as new TV box sets each month. Want superfast broadband and Sky Fibre? You can also find great deals on these too from the best performing major provider; Sky. Chitter Chatter is one of the only ‘single operator’ retailers in the UK, providing unrivalled knowledge of the EE brand. With an exciting range of EE services on offer as well as an extended handset range, exclusive offers and the best SIM deals in the UK. With Chitter Chatter you can rest assured that you’ve found a dedicated EE partner who’ve been delivering excellent customer service for the past 20 years. 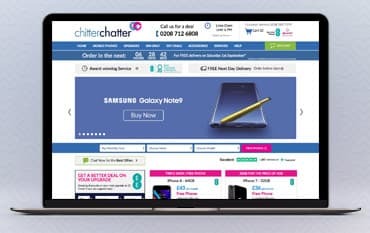 Shop online at Chitter Chatter with a discount code from us enjoy incredible savings on mobile phones, EE upgrades, EE SIMs, accessories and much more.